Today I have something a little different for you - normally I go out and scour the intrnet for nails, but today I bring you Alexis Apodaca, who submitted her own nail art, and I thought it was worth sharing with everyone. Alexis is in the process of learning right now, and is doing quite well for being self taught!. 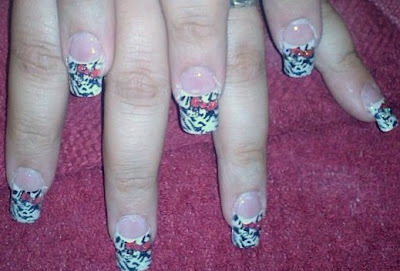 This is a set of nails she did that are Zebra and Hello Kitty themed. :) She plans to keep on practicing and eventually maybe become pro, but she's off to a great start! Dont forget, you can submit your own nail art too! Just click the button on the right hand side of the blog that says "Submit your own nail art"
As for Diva Pirate, I'm off to a Young Nails Gel class tomorrow during the day and then I'm flying out to go back offshore :( However this time around I've actually brought a bunch of polish, an acrylic paint kit, lots of different brushes, and im hoping to get some quality practice painting in. So maybe i'll be able to put some of that up here soon. Don't worry though, I still have a couple posts of real nails that I've done coming up for your viewing pleasure. Wish me luck at the class!